At 0.9 oz for the Small (4L) – I ended up taking two. One to cram in my down sleeping bag and one to protect my spare clothes. Theresa needed to take the Medium (8L) at 2.3 oz to fit her bulkier bag. 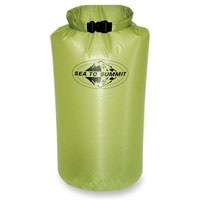 Available from backcountrygear.com starting at $11.95 for the small. This entry was posted in Backpacking, Gear Reviews, Sleeping on March 30, 2008 by brett.